As it's officially autumn I have been craving my go to jeans over my beautiful summer dresses. I really need some more style in my life! Which means gorgeous dresses, richly coloured woolly tights and ankle booties paired with a leather jacket. 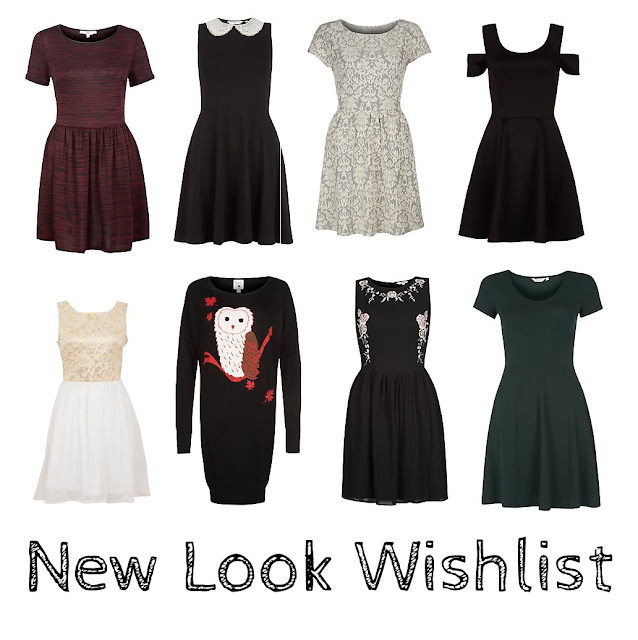 New Look is the perfect place to start my search for day dresses and I have trawled their website and found my favorite picks for the autumn season. Their dresses quirky, cute and are hard to beat for the price! Classic with a slight autumnal/grunge twist. I'm not usually one for loud prints but my friends own a few of these and they look gorgeous! Because who doesn't love the cold shoulders? I love the quirky embellishment, it really makes the dress pop. What I really love about this dress is that you can dress it up or down. As you can probably tell I'm quite the skater dress fan! I'm not a huge fan of loud prints or bright colours during the colder months so I tend to side with burgundys, navys and greens (not forgetting blacks - but when are these ever out of fashion! ).